Start your morning off on the right foot with this mouth-watering Egg & Prosciutto Sandwich with Tomato Tarragon Sauce recipe. Warning – this prosciutto sandwich can get messy but who cares when it’s overflowing with flavor and deliciousness. It all starts with a perfectly toasted brioche bun covered with a lemon aioli and topped with thinly sliced Prosciutto di Parma, a sunny-side up egg (the runnier, the better), spicy pepper jack cheese and a tasty tomato tarragon sauce. This will certainly hit the spot on an early workday morning or after sleeping in on a lazy weekend. 1. In a large nonstick skillet fitted with a lid, add the olive oil. 2. Preheat the skillet to medium-high heat. 3. Add the garlic, tomatoes, salt, and pepper. 4. Cover the skillet and shake the skillet occasionally until the tomatoes begin to burst about five to seven minutes. 5. Once the tomatoes have burst, remove from heat and slightly mash. 6. Stir in the scallions, tarragon, vinegar, and more salt and pepper if desired. 7. Set aside until ready to garnish egg sandwiches. 1. In a small bowl, combine mayonnaise, garlic, lemon juice, lemon zest, salt and pepper. 2. Take some of the lemon aioli and spread it on top and bottom of the brioche bun. 3. 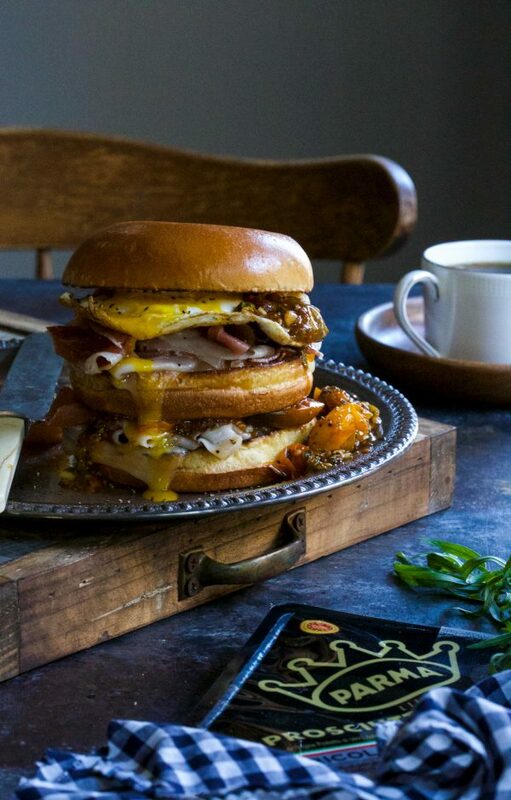 Place a slice of pepper jack cheese on top of the bottom bun followed by two slices of Prosciutto di Parma. Repeat process with remaining three buns. 4. Next, preheat a medium skillet to medium-high heat. 5. Crack four eggs into the skillet. Continue to cook the eggs until the yolk is slightly opaque about four minutes. 6. Remove the egg and place it on top of the prosciutto. Repeat with remaining eggs. 7. To serve, place a large spoonful of the tomato tarragon sauce over each egg. 8. Top with top bun, serve and enjoy!